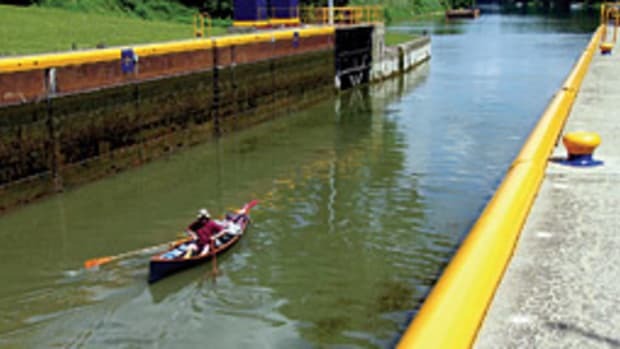 "Now I know what&apos;s meant by &apos;steering committee,&apos;" the lock tender said with a laugh as the water, rushing through the sluice gates of Erie Canal Lock 32, raised us to his level. Karin was at the tiller of Seneca, our 42-foot charterboat, and I had my hand on the controls of that loveliest of maneuvering cheats: the bow thruster, which effortlessly moved the bow to port or starboard. Chuck and Karin Gedge and my wife, Laurel, and I were on our first full day of a weeklong voyage in July on the western end of New York&apos;s historic Erie Canal. During our trip, we would cover 90 miles of water through varied and mostly bucolic landscape, all seen in slow motion at about 6 mph. We would visit 10 canal towns, each with something to offer: a museum, a good meal, some historic architecture or simply the embrace of small-town America. And our boat was a self-contained mobile home, offering everything we needed. Click here for West Coast writer Karl Zimmermann&apos;s exploration of this East Coast cruising treasure.